Convention medicine, which has been developed since 19th century, is for acute care, the diagnosis and treatment of trauma or illness that is in need of emergency care, such as stroke, or broken arm. Nothing can do for complex chronic diseases. It is the reason that why high cholesterol, and high blood pressure can be treated, but unfortunately cannot be cured. Convention medicine, which has been developed since 19th century, is good at acute care, the diagnosis and treatment of trauma or illness that is short term, and in need of emergency care, such as stroke, or broken arm. Practitioners only need to apply pre-set treatments such as surgery or medicine that target at the immediate health problem or symptom. Nowadays, most medicine cares for common chronic diseases, for example: high cholesterol. Almost All high cholesterol medical treatments have unique goal that is to lower the cholesterol level, they put aside the underlying causes of high cholesterol, then high cholesterol become treatable health problem, but unfortunately cannot be cured; High cholesterol patients have to take prescription and suffer Satins side-effect for lifelong. Functional food Therapeutic Lifestyle Change Mediation/Intervention Program [ aka Functional Food TLC] just be invented against High Cholesterol in side-effect free, effective natural health therapy way. It is a System-Oriented approaching and has both patient and healthcare practitioner integrated into an interactive partnership. It is revolutionary in healthcare industry; it can better address the patient need. By updating the traditional disease cantered focus to a more patient-centered approach; Functional food TLC practitioners can spend more time with their patients, acknowledge patients’ more detail information as to family genetic issue, living environment, lifestyle factors which may have influence at their complex chronic health issue,… and so on. 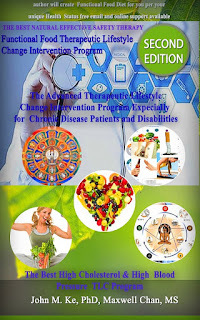 By this way, Functional food tlc can better serve each patient unique expression of health, and treat patient’s unique, complex, chronic health problem. Functional Food TLC offers a powerful new healthcare system and clinical model for assessment, treatment, and prevention of chronic disease to replace the outdated and ineffective acute-care models carried forward from the 19th century. Functional Food TLC incorporates the most value God-pharmacy-functional food, the best, most effective side-effect free natural health remedies, Great abstracts of traditional Indian and Chinese Medicine, and understanding of how environmental and lifestyle factors influence the emergence and progression of disease. Functional Food TLC enables physicians and other health professionals to practice proactive, predictive, personalized therapeutic Lifestyle Changes, and empowers patients to take an active role in their own health. www.functionalfoodtherapeuticlifestylechangeintervention.com is owned by SkyBLUE Cross Corp., which is a Complementary and Integrated Medicine consulting company based in Toronto, Ontario, Canada. Founded in 2006. SkyBlue Cross believe Complementary and Integrated medicine as kind of Great Pyramids of medicine and health, and many human being treasures of medicine have been discovered and served people in the world.